Space weathering refers to the gradual alteration of materials when they are exposed to the harsh space environment. Lunar samples, and to some extent meteorites, have provided a benchmark for understanding the processes and products of space weathering, but understanding the causes and the effects of space weathering on different planetary surfaces, however, is not simple. The SSERVI team at Brown University (PI Pieters) recently published a paper in the Journal of Geophysical Research on space weathering processes and their alteration products as currently observed for airless bodies of the solar system. There are multiple simultaneous processes that alter surface materials on bodies that are not protected by an atmosphere. Soil maturity is a relative term, commonly used for the Moon, that is intended to evaluate the degree to which a given surface soil has weathered. Exposure age is a quantitative laboratory measurement of how long a rock or soil grain has been exposed to space and is based on precise measurements of accumulated products such as solar wind noble gasses or cosmic ray tracks. Space weathering processes can be loosely grouped in two broad categories related to (i) random impacts by small particles or debris found throughout the solar system or (ii) irradiation by electromagnetic radiation or atomic particles from the Sun, galactic sources, or magnetosphere. The wide range of impact and irradiation subcategories spawn numerous specific processes, many of which can be evaluated more directly with observations, experiments, and/or modeling. The energy released in impacts, for example, breaks apart larger particles into smaller particles, but it also melts and vaporizes some of the host and impactor material (which leads to a range of possible alteration products). Depending on impact parameters (velocity, target composition, geometry, etc. ), a portion of the impactor may be retained and mixed with the host in the combined product. Repeated impacts of various sizes also stir and mix previously processed regolith particles to different depths (known as soil “gardening”), so the actual time spent on the surface by an individual grain varies. At the atomic or molecular scale, individual grains residing on the surface are awash in energetic solar wind atoms or ions leading to a release or rearrangement of surface components by sputtering. The original crystalline structure of the uppermost surface of a grain can record damage by intense solar UV radiation and energetic cosmic rays. Day to night thermal cycling occurs during rotation of the planetary body and can lead to structural fatigue of surface materials, but may also alter composition through loss of volatile species by radiant heating or sublimation. With time, a host of alteration products accumulate on the surface and are recycled multiple times through several of the processes mentioned above and illustrated in Figure 1. The complex array of processes involved in space weathering of airless bodies. Typical soils are particulate but heterogeneous in composition. (left) Dominant processes affecting the surface of the Moon at 1 AU [after Noble, 2004]. (right) The broad range of surfaces processes now believed to be active across the solar system but with different degrees of prominence for specific environments. Due to the diversity of environments and type of materials comprising planetary surfaces, space weathering can have many forms and is inherently controlled by which processes are most active in a specific situation. Combined products of space weathering processes are necessarily a function of location in the solar system (impact speed and flux, radiation environment, and temperature), type of planetary surface (composition, size, and texture of the host), and length of time a surface is exposed. Experience from the Moon and virtually all planetary bodies visited to date indicates that ancient surfaces consist of both coarse and fine particulate material. Boulders and outcrops of rocky or coherent solid material are common, but a particulate regolith develops over time. From our current experience, it is largely the regolith that accumulates and records the principal effects of space weathering. Detailed analyses of lunar and asteroid samples in Earth-based laboratories provide a cornerstone for recognizing and understanding key aspects of several space weathering effects. Using the insights gained from these samples, it is often possible to extrapolate an understanding of weathering processes to bodies for which we have only remote data. A handful of additional bodies have been visited by spacecraft and studied in detail for extended periods with orbiting remote sensors (Mercury, Eros, Vesta, and recently dwarf planet Ceres and comet Churyumov-Gerasimenko). The satellites of Mars, Jupiter, and Saturn have been studied to lesser degrees through the decades by multiple flybys of instrumented spacecraft. Additionally, asteroids have been observed with instruments during a single flyby of a spacecraft (usually on its way elsewhere for its prime mission). Most recently, the most distant solar system objects visited, Pluto and its satellites, have revealed some of their secrets. The amount and type of data now available to study the surfaces of airless bodies is exceptional—but it is also extremely uneven in character and quality. Various forms of space weathering are now recognized (or hypothesized) based on the clues currently available from the data in hand. 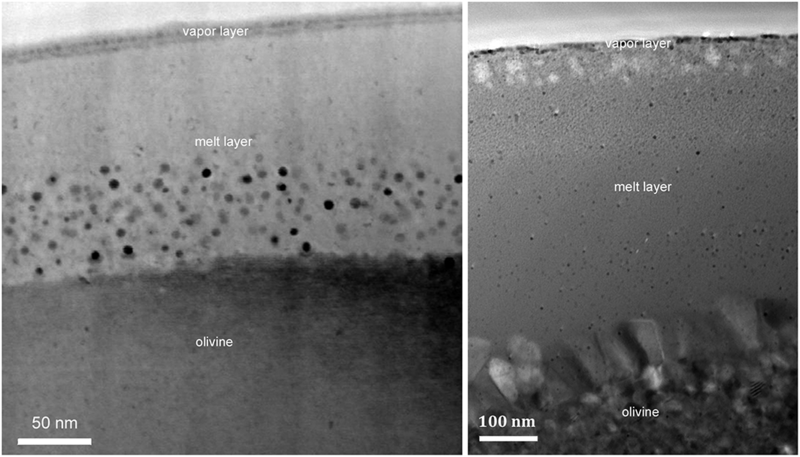 (left) TEM analysis demonstrates that nanophase iron is produced in the melt and vapor of both experimentally laser irradiated [Noble et al., 2011] and (right) natural micrometeoroid impacts into olivine [Noble et al., 2016]. The concept that space weathering produces a measurable effect on the surface properties of many/most airless bodies became well established with analyses of lunar samples, but understanding the physics and products of interwoven processes that are involved encompasses multiple areas of active research. For example, even at 1 AU where the Moon and near-Earth asteroids reside, discussion and experimental approaches focus on the relative effects of products from micrometeorite impacts versus those arising from solar wind interactions. Embedded within this debate is the timescale for either process to accumulate measurable products within a continually mixed regolith. The unique advantage of being able to analyze actual lunar and asteroid regolith samples using ever increasingly sophisticated instruments in Earth-based laboratories cannot be overstated. Likewise, understanding the effects of weathering processes naturally becomes even more difficult and complex for other environments of the solar system that are less well known. For more information, read the full paper. 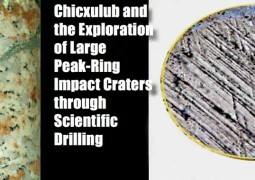 For the first time, geologists have drilled into the peak ring of Chicxulub crater, famously linked to the dinosaur extinction event.